Mandatory Access Control (MAC) is a type of access control in which the operating system is used to constrain a user or process (the subject) from accessing or performing an operation on an object (such as a file, disk, memory etc.). objects are system resources such as files, sockets, etc. security attributes are the security context. 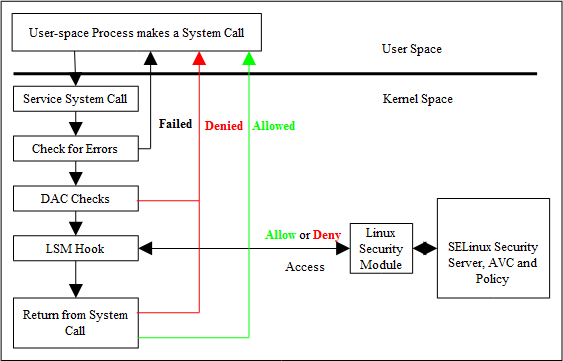 Security Server within the Linux kernel authorizes access (or not) using the security policy (or policy) that describes rules that must be enforced. Note that the subject (and therefore the user) cannot decide to bypass the policy rules being enforced by the MAC policy with SELinux enabled. Contrast this to standard Linux Discretionary Access Control (DAC), which also governs the ability of subjects to access objects, however it allows users to make policy decisions. The steps in the decision making chain for DAC and MAC are shown in the Processing a System Call diagram. Type Enforcement - Where processes run in domains and the actions on objects are controlled by the policy. This is the implementation used for general purpose MAC within SELinux along with Role Based Access Control. The Type Enforcement and Role-Based Access Control (RBAC) sections covers these in more detail. Multi-Level Security - This is an implementation based on the Bell-La Padula (BLP) model, and used by organizations where different levels of access are required so that restricted information is separated from classified information to maintain confidentiality. This allows enforcement rules such as 'no write down' and 'no read up' to be implemented in a policy by extending the security context to include security levels. The Multi-Level Security and Multi-Category Security section covers this in more detail along with a variant called Multi-Category Security (MCS). virtual machines use MCS categories to allow each VM to run within its own domain to isolate VMs from each other (see the SELinux Virtual Machine Support section). Android devices use dynamically generated MCS categories so that an app running on behalf of one user cannot read or write files created by the same app running on behalf of another user (see the Security Enhancements for Android - Computing a Process Context section). This page was last modified on 7 April 2017, at 09:08. This page has been accessed 68,486 times.